I have always (always!) counted myself supremely lucky that I stopped reading these titles just before this abomination of a story appeared... I'm *still* counting my blessings! I wonder if part of the problem with "The Crossing" and why it was so swiftly buried isn't much the same problem that the Clone Saga had--namely there was so much rather unpleasant heavy lifting involved in ratcheting the direction of the books back to where they people making them thought the fans wanted them to be that the heavy lifting negated any goodwill that then might have occurred. Plus, when Marvel set the clock back in those days, they shut the door, bricked over the door, and reinforced it with steel. Again, look at the Clone Saga, which was walked back swiftly (and somewhat sloppily, really) in like, two issues, I think? Your recap of Iron Man #325 was very much like my own read of it, by the way. It very much felt like they were reading from the Kyle Rayner playbook. Though Kyle Rayner never, to my knowledge, had a professor he fancied who used to be his girlfriend from an alternate timeline whose husband turned himself into a cut-rate Iceman. No, he just had Donna Troy. Splendid series, Gary! You found a lot more worth in "The Crossing" than I would ever have found possible myself, and I hope someday soon you'll do the Heroes Reborn Avengers, which features 6 issues or so of Lifefeld trying hard and the rest is just Simonson alternately doing damage control and taking the piss. Kazekage, always great to hear from you here! 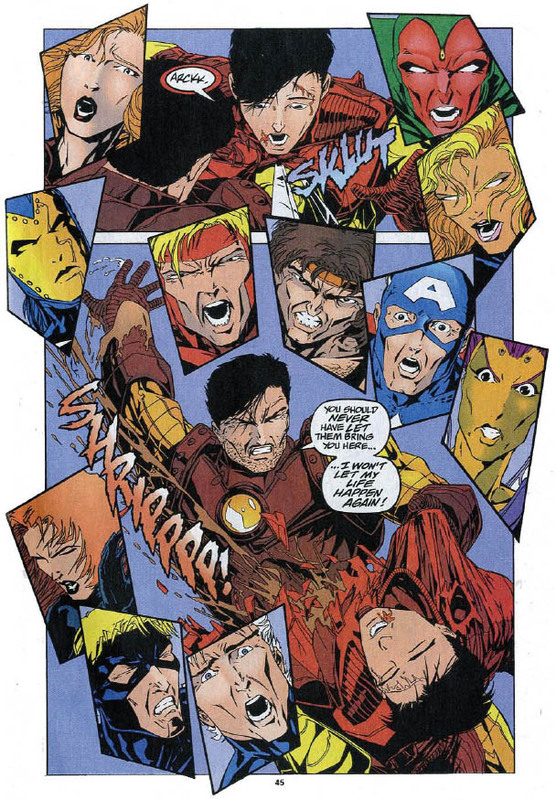 Admittedly, for the Avengers themselves, the worst issues to resolve were Teen Tony and the Eidolon Warwear. Wasp was easily enough cured. Skye claimed the Warwear had to be worn "forever" and, well, you had a Tony Stark that was quite dead, so there had to be a way of bringing him back and sending Teen Tony off into the sunset. My bet would have been using something akin to the Forever Crystal in Avengers Forever, disrupting Kang's plans at an early stage, stopping one such encounter and hence the timeline would change so that he never died. That, or I'd imagine some Cotati involvement could have resulted in a resurrection, perhaps by the Celestial Messiah when he finally stepped out of the shadows. I must admit I love the idea that Hank Pym's many breakdowns came about from being able to (just barely) resist Kang's manipulation attempts over the years. I didn't like the retcon of that retcon. I also wanted to see just what kind of "villain" could horrify Kang into doing what he did during "The Crossing." Was the Celestial Messiah really evil? 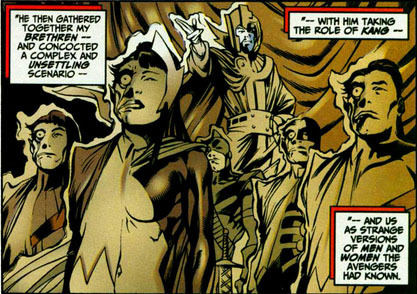 Would it have been a version of "Infinity Crusade" with its "good" side of Adam Warlock being worse than his bad side? Was there some greater threat the Celestial Messiah was ramping up to defeat? Such delicious questions without answers. Who knows what I'll do next? Maybe "Heroes Reborn" will be on the list sometime. I'm up for suggestions, certainly. Will you do a series regarding Impact Comics? Thanks for reading! Unfortunately I am not familiar with Impact Comics, so I probably won't be doing a blog about those characters anytime soon. Sorry! Mark Wheatley, Rick Burchett, Neil Vokes, Tim Sale, Trevor Von Eeden, Mark Waid, Tom Lyle, Joe Quesada, Chuck Wojtkeiwicz, Rags Morales, Paul Kupperberg, Len Straziwski, Mike Parobeck, Carmine Infantino, WML, Ken Penders, Don Secrease, and Dave Johnson! I have a Mark Wheatley convention sketch coming up. Stay tuned! Although I respect your appreciation for "The Crossing" storyline, I have to admit that one of my favorite parts of Avengers Forever is that Busiek cleaned up Kavanagh's and Harras's mess. As you acknowledge, the primary point of "The Crossing" was to de-age Tony Stark as a competitor for the new, young Green Lantern at DC. The resulting storyline is thus an unnecessary, convoluted hodgepodge of kewl "ideas" and mysteries that were clearly posed before anyone had any idea of their resolutions. I think Moonraker is a good example of this: while "his history came with him!" sounds interesting, it's ultimately meaningless. Unless the other timeline versions of Spider-Woman, etc., come with him -- that is to say, the physical manifestations of his history -- then all that's happened is that Moonraker has brought his memories with him from another timeline and, for some reason, some people don't realize he wasn't always there. The door in the Avengers basement is another, probably better example of this. Harras and Scott Lobdell were close, and Lobdell was infamous for introducing "mysteries" that he didn't know the resolution to; the basement door always seemed like a Lobdell plot device to me. You note that, although the storyline had a plethora of artists, it had a consistent stable of writers. This was a problem because -- let's be honest: Terry Kavanagh was a horrible writer. Perhaps he didn't have the time to develop the skill to differentiate "big" ideas from "good" ideas, but Teen Tony is a prime example of a bad idea poorly developed. In retrospect, "The Crossing" is where I began to grow disenchanted with comic books. I continued to collect until 2001 or so, when Bruce Jones's and Axel Alonso's extended middle finger of a Hulk run finally drove me away. In many respects, that run was the NuMarvel version of "The Crossing": ideas more important than execution, characterization less important than big moments. Oh well. Thanks for the extended analysis! Gary--thanks! How could I resist throwing in my two cents about the senses and sensibility-shattering finale of "The Crossing?" The Hank Pym thing was pretty clever, but I think they also tried to suggest that Old Tony's drinking problems were related to Kang messing with him, and making a personal weakness into something a blue guy from the future is doing to mess with you hurts the relatability of it somewhat. There were things I quite liked in the Clone Saga. I'm not a die-hard Spider-Man fan at all, so I don't mind the odd bit of irreverence in terms of changing who Spider-Man is or whatever. Plus, the Ben Reilly Spider-Man suit was some pretty sharp design (the Scarlet Spider suit a bit less so, but oh well) it was far too long, of course, and they wrung just about every dollar they could out of it, but again, as someone who was willing to tolerate some irreverence, the bits I read really weren't that bad. I actually thought "Teen Tony" was a secondary focus to the storyline. 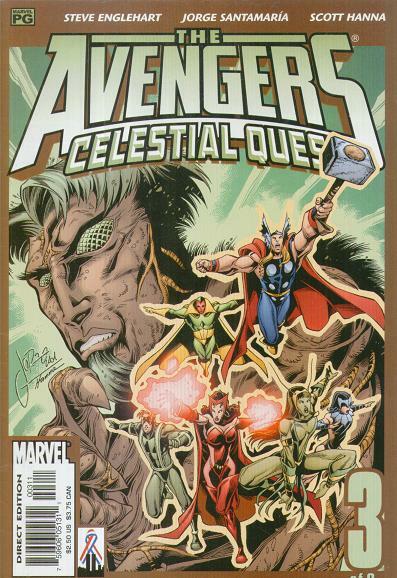 The first was to involve the Avengers in a cosmic-level storyline in the mold of "The Kree-Skrull War" and "Celestial Madonna" storylines of earlier vintage. To that end that's why Harras & Kavanagh went to lengths to frame Kang's entire plan as his counter to a larger adversary (the Celestial Messiah). The problem was, with four main titles, the story looked to be Clone Saga-sized in scope. I still counter that it might have worked in a pared-down version, emphasizing the Avengers couldn't be sure whether Kang's enemy was a threat to them or the entire universe, or if, by virtue of Kang being one of the bad guys, they were worrying for nothing. Agreed on the Jones/Alonso Hulk. Yikes, and to think I might get to reviewing that stuff someday...! Kazekage, I don't think I quite see the same implication that Kang caused Tony's drinking problem. 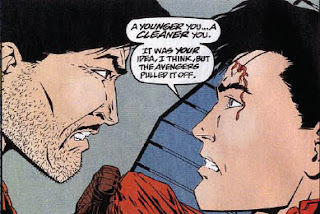 Although you might be able to make a case for it, I thought the "Teen Tony" issues of Iron Man explored that the drinking problem was still there even in a character Kang hadn't gotten to. Heroes Reborn Hulk...yikes. That's all I gotta say. All I can think of his how badly Jim Lee drew him. Gary--I'm sure the "Kang was responsible for drunk Tony" thing was buried in amongst all those mind-mangling issues of Iron Man from during The Crossing. I could be conflating it with the Pym thing, however, as I am somewhat reluctant to go back and read those Iron Man issues to find out. I do remember the Teen Tony stuff, where he gets drunk for the first time and it's supposed to be all ominous. I was, however, slightly distracted by the major continuity gaffe in those same series of issues (Meredith McCall is married and teaching at Stark's college . . .even though she was unmarried and a member of the Masters of Silence maybe two years ago. Man, no one really does read Annuals, do they?) which was even more distracting. All I can think about is how bad Liefeld and Portacio and . . .hmm, I'm actually have a problem remembering someone who didn't draw HR Hulk (not to be confused with HR Pufnstuf) badly, really. A great set of posts. I remember reading the Crossing at the time and having mixed feelings about it. 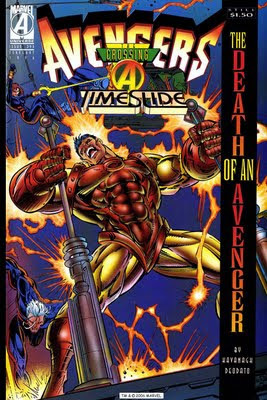 One that seems bizarre now is that I felt Iron Man was the wrong character to base such a major storyline around because he hadn't been seen in the regular Avengers title at all for nearly four years (and his last appearance had been Operation Galactic Storm, an event with "everyone who was ever an Avenger"). As someone who'd started reading the book in the interim and who hadn't really read Iron Man at all before it just felt odd to be basing things so heavily on him. The storyline wasn't helped by the lack of any clear order to read the books in - I have memories that Iron Man and Avengers seemed to switch places midway - and was compounded by shipping problems as it came out in the first months of Marvel's self-distribution nightmare with books turning up in the stores at random. Also some of the stuff wasn't decently explained there and then - for instance the whole thing about Gruenwald's position on time travel changes was rather obscure to many, especially given that different rules had applied for the Age of Apocalypse X-Men crossover and it shouldn't have taken letters pages to explain it. There were some other details that only came out in guides printed in Avengers Unplugged - for instance I think they were the only place to *explicitly* identify Tuc as the son of Crystal & an unknown father - and it just added to the sense of mess. Plus there was the poor follow-up. Looking back it seems clear(ish) that the original plan was to end the storyline in the Timeslides oneshot as with other Alpha/Omega books in crossovers, and then launch Teen Tony in the double-sized Iron Man #325 which would probably have had time to flesh him out. Instead that issue and Avengers got taken up with the ending of the storyline - and Iron Man didn't even die in his own book! - and then along came another crossover designed to reunite the Big Three Avengers, so Teen Tony never really had a proper launch. There's one other Crossing related book that you may or may not be aware of, Spider-Man Team-Up #4 in which Clone Spidey and the Avengers team up to fight Kang's Spider-Man robot from way back in Avengers #11. Whilst the overall plot is dire, the story is bizarrely about the only attempt to show the reaction to the changes in Tony and Jan both by themselves and by others around them. It's a small step but it's about the only one actually taken. Despite all this the storyline reasonably works as a adventure on the desperate stakes if a) you try not to think about it, and b) don't have much attachment to what the revelations meant. I knew very little about Hank's breakdowns at the time so the revelation just bounced aside; now I see that bit as terribly crass. Overall it had great ambition and appalling planning, leaving people asking too many questions that will never be answered. Thanks for posting, Tim! Some great insights. It seems on the one hand that TPTB used "The Crossing" to bring Iron Man back into the fold, as in the previous two years, they got him really far away from the Avengers, taking West Coast Avengers and turning them into Force Works. On the other hand I have to wonder if it meant they knew that Force Works would be canceled following the end of "The Crossing," since Stark was clearly at the center of that group. Could that team even go on sans Stark's involvement? Come to think of it, the mid-90s Avengers didn't really feature any of the heavyweights--the biggest star of the team was, I think, Giant-Man (no pun intended). 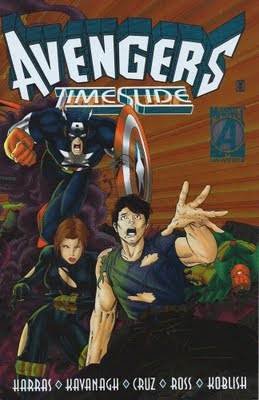 Cap, Thor and Iron Man were all phased into the Avengers all over again, with some of them returning in "TimeSlide." They even seemed to realize what they were doing, with the "First Sign" crossover occurring the month after "TimeSlide," barely giving the new status quo room to breathe. I am indeed aware of Spider-Man Team-Up #4--I believe I have a B.A. in the Clone Saga--and yes, it's a strange one! The Clone Saga was a picture of solid structure compared to the Avengers and the status quo in the wake of "The Crossing." Citing the examples you do from Avengers Unplugged....yikes. Pym's breakdowns due to Kang, crass? Perhaps, perhaps. I'm tempted to say "it's comic books, it doesn't have to be super-serious." Too much is made of reality, of grim and gritty for the sake of being true to life when truthfully we're talking about characters that should appeal more to kids than they have since maybe the 80s. (I'm a child of the 80s and my gateway book was Hulk. Okay, maybe I'm not normal.) 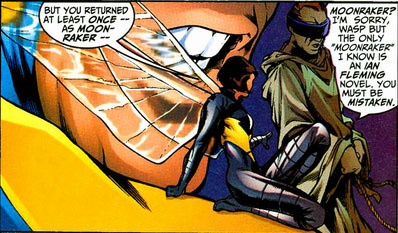 Pym's mental breaks have led at turns to his emergence as Yellowjacket and his WCA career as, um, Dr. Pym. Why not ascribe a comicbooky explanation to his behavior? Man, you are right about AoA not following Gruenwald's rulebook. Sigh. Regarding the heavyweight Avengers, Captain America was generally on the team for much of the 1990s with only two short breaks - one of about nine months after Galactic Storm but he returned even before Hank started growing again and the other was at the time of the Crossing because in his book he was missing presumed dead for a while. Otherwise he was there pretty continuously. The original Thor had a lengthy absence due to events in his own book, though Eric-Thor was on the Avengers throughout his time in the role. (Curiously in his Thunderstrike days he was shown working in the Avengers far more in his own title than in the main book!) For much of Harras's run that was probably for the best as it allowed him to mainly develop characters who weren't appearing elsewhere and give them some good material, especially the Black Knight. As for the breakdowns, the crassness really stems from the retroactive explanation. Before that they had been ascribed to causes that people face in their everyday life and had been a portrayal of a character facing a crisis that many people in real life have faced, leading to a tale of fall and the long path of redemption. Now that was swept away and made the influence of a supervillain, rather undercutting the edge of that earlier story and making light of the recovery. It just feels wrong to rewrite all that in such a quick manner - and it was hardly appealing to kids. As I recollect, Abnett and Lanning were supposed to launch a second Avengers book, The Mighty Avengers, from the end of Force Works. However, the signing of Lee and Liefeld put an end to those plans. Good job with the Crossing review. As much as the Crossing was a missed opportunity though, it might be pointed out that Bob Harras was Editor-in-Chief when Busiek did the hatchet job on the Crossing. If Harras didn't even fight to defend his own story, that says a lot about what the Crossing was: a despiration Hail Mary play that failed. Even though the gears of the storyline stick out, I have a small appreciation for that story: the creators had long odds to struggle against and it's sad that all that's left is what the Crossing wasn't rather than what it was. That's a great note that Harras didn't step in to defend his own story. While it's true he wasn't immediately overseeing the story (that would have been Tom Brevoort's job, I'm pretty sure) he would have had some idea what was happening and could have steered Busiek in another direction. Then again, Harras does strike me as understanding the characters were never his but Marvel's, and another writer could do as he pleased. Amusingly enough, the 'Crossing' version of The Wasp received an action figure from the Spider-Man line of the 1990s! "Let's see this puppy in collected editions in '12, yeah?" 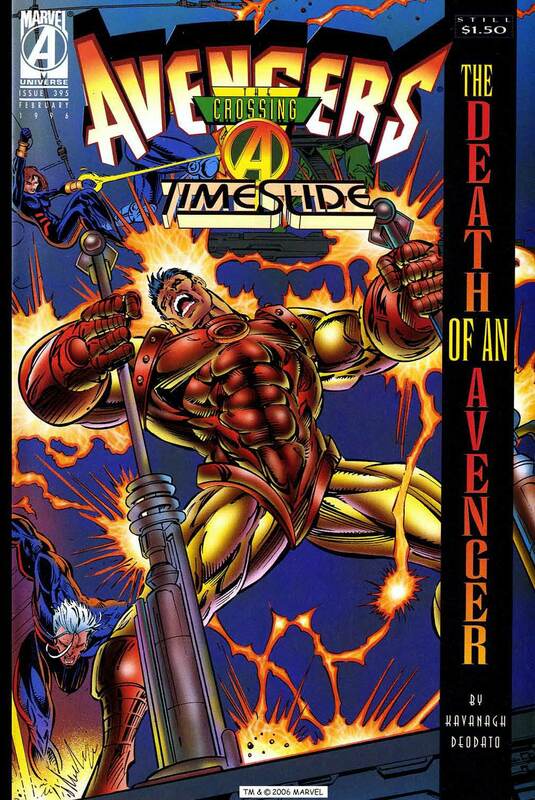 Marvel is planning to release 'AVENGERS: THE CROSSING OMNIBUS' in February, reprinting this event! I hated Gruenwald's timeline theories: I assume he was trying to simplify things, but if every event and every time-change goes two ways, then every event is robbed of significance because in a cosmic sense it doesn't matter (as one of Larry Niven's stories once pointed out). "This is the first I'd heard about a Mighty Avengers spinoff, but it makes sense that something like that would spin out of "The Crossing""
There was a whole article in Wizard at the time of the Crossing outlining how the Avengers franchise was going to be reordered with new titles after the Crossing. 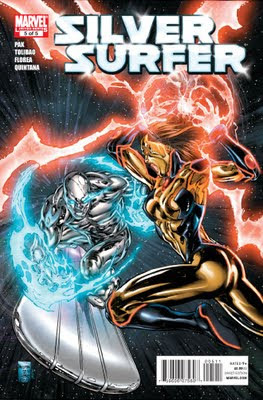 After the fact, I've come to suspect that it was a deliberate fakeout to keep the wraps on the imminent Heroes Reborn. It stretches my disbelief a bit too much that both the Wizard-outlined revamp *and* Heroes Reborn were on the table simultaneously. One of them had to be a smokescreen for the other. Just my opinion. Well, that's possible. But it seemed to me that Heroes Reborn was sprung upon Marvel without a lot of editorial input. The negotiations with Lee and Liefeld were spearheaded at the corporate level from what I saw and I doubt Marvel had more than 6 months to set things up. The Crossing was initiated the previous year, before they likely could know about it. They would have had to have plans to follow the Crossing and considering the work Kurt Busiek had to do clean up the dangling plot lines, I don't think the Crossing was meant to be threading water as a fake out would imply. Those months were chaotic at Marvel, what with going from 5 Editors-In-Chief to 1 and the market collapsing, so only the ones working on the titles at the time might know for sure. Candidates who may be able to answer are Dan Abnett, Andy Lanning. and Terry Kavanagh. They rest were artists who are usually the last to know and the editors who may be under NDAs from Marvel. Great read! I love in-depth retrospectives of old comic sagas, and "The Crossing" is one that doesn't get much play. While I'm less forgiving of its flaws, it'll always hold a tiny place in the bottom of my cold heart as the story that got me into collecting Avengers regularly. What can I say, I was at the perfect age to fall hook, line, and sinker for all that "Everything you know is wrong, nothing will be the same again!" marketing claptrap. My recollection of the time is very much that editorial were planning in one direction and corporate in another - the announcement about Heroes Reborn came about late November 1995 and caught quite a few on the hop. Bob Harras let it be known he was opposed but by the time he was in place as Editor-in-Chief and had any influence to fight it the agreements were already signed. (The five group EiCs set-up really undermined the authority of the post.) Mark Waid accepted the post of Avenges writer from issue #400 onwards in this period, dismissing the HR rumours as unbelievable nonsense, and subsequently gave an interview stating he wouldn't have accepted the job if he'd known he'd be doing just one issue and two crossover chapters. When the Crossing came out in 1995, I was horrified. This story, along with the Clone Saga, was pushing me out of comic collecting, of which I was a 23 year veteran (my wife was overjoyed)! Within the next few years, I sold most of my collection, and pretended the Crossing, Clone Saga, Heroes Reborn/Return, Norman Osborn return, had never happened! Now, nearly 20 years later, my interest in comics has been rekindled (much to the horror of my wife), and I recently purchased the Crossing omnibus. Maybe it's me, but I really enjoyed reading it as one uninterrupted story (in 95 I did not collect Force Works or War Machine). It was pretty creepy seeing Stark as a villain and killing people left and right. Even the writing of Andy Lanning, Dan Abnett, and Ben Raab didn't bother me. I even enjoyed Rhodey's Eidon (sic) armor! Wow! Anyway, thanks for the blog on this obscure storyline. It, like the Clone Saga, probably could have been successful if the comics market wasn't going to hell in a handbasket at the time of its publication. Totally agree with a number of points. RE: Vietnam, the other interesting implication of this abandoned plot would be whether Tony Stark had accessed the "services" of Mantis during his time there in the War before she had become the Celestial Madonna. How awesome would it have been to discover some previously unknown relationship between the two? Kang's claim to be responsible for Hank Pym's psychotic breakdowns could have led to some interesting revelations about whether he had some alliance with the Creature from Kosmos in Ant-Man's early career, given he had earlier obtained "growth pollen" from the world Kosmos for use in his Growing-Man simuloids. RE: Tony being Kang's sleeper agent he placed within the Avengers, personally I was hoping at the time they would reveal that Tony was actually a younger version of Kang. Yes, Tony would really go on to become the Conqueror (and they'd scrap that stupid plot that Kang was Nathaniel Richards). One could even reveal teen Tony as Ironlad these days!!! Just left a comment but it seems like it might have disappeared... Don't think I will retype it. Just going to say that The Crossing Omnibus was my first exposure to this story. So many parts and characters didn't make much sense to me, so it's good to find it all explained here. And boy the art was almost uniformly atrocious. Thanks for the great series of write-ups, Gary. I differ from you. I despise the Crossing. It damaged so many characters the way 90s events from Marvel and DC so often did, took too long to go anywhere, was too mysteriously overwrought, had seriously erratic and inconsistent art, was not internally consistent, employed some incredibly insipid ideas (Teen Tony? ), and just all-round was one of the worst things to come out of Marvel. 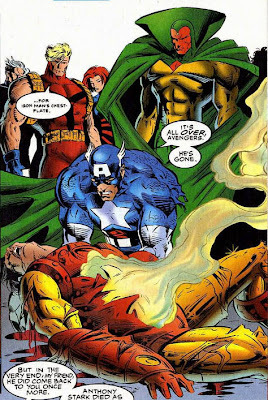 At that point, I'd been reading Avengers for 5 or 6 years and they had become my favorite team. I was collecting all the Avengers books at the time, but I was a teenager, with no discriminating tastes. It wasn't until the mid-00s that I was able to look back and see how horrible that story was. I'm glad it was retconned. The only thing I don't like is not knowing how the original story was supposed to be concluded (i.e. the villain Kang and Mantis were preparing against; I know you believe it was the Celestial Messiah, but I'd like to see confirmation from Kavanagh or Harras on that). This story is one of the lowest points in Avengers history-matched only by Liefeld's Heroes Reborn era.